Kawhi Leonard’s Spurs face Steph Curry’s Warriors in a matchup of the best NBA’s best defense and offense. Tonight, the unstoppable Golden State Warriors meet the immovable San Antonio Spurs in a showdown between the NBA’s No. 1 offense and its No. 1 defense, two units that aren’t merely at the top of the league, but rank among the best we’ve ever seen. It’s the game of the season — no, check that, it’s the loftiest NBA game ever played according to our in-house Elo ratings. It’s practically unheard of for a matchup of this caliber to take place outside the NBA Finals, where both teams’ ratings are necessarily sky-high because they’ve made it through the notorious gauntlet that is the NBA playoffs. For it to happen during the regular season, you’d need two teams flirting with a 70-win pace — and that’s exactly what San Antonio and Golden State are doing this year. It’s fair to ask whether there’s also something bigger going on here: Three of the 10 best combined-Elo games in NBA history1 have taken place in the last 10 months, and two in the last 32 days. Does the NBA suffer from an epic lack of parity these days? Is Elo itself miscalibrated? Those questions are beyond the scope of this post, but know that, by any metric, the Warriors’ and Spurs’ first meeting of the 2015-16 season makes for a titanic matchup. Tonight’s game also poses a more specific question: What happens when historically great offensive and defensive units meet? The short answer is that the Spurs and Warriors are playing at such a high level that we don’t really have a good historical precedent. Here’s what we do know: Defense-oriented teams have a higher probability of winning the NBA title at a given level of (regular-season) performance than their offensive counterparts. This gap only widens as a defense (or correspondingly good offense) becomes more dominant. And great defenses also have a slight edge in head-to-head clashes against great offenses. In preparation for Monday’s tilt, we did some digging into historical battles between the league’s best teams on each side of the ball. 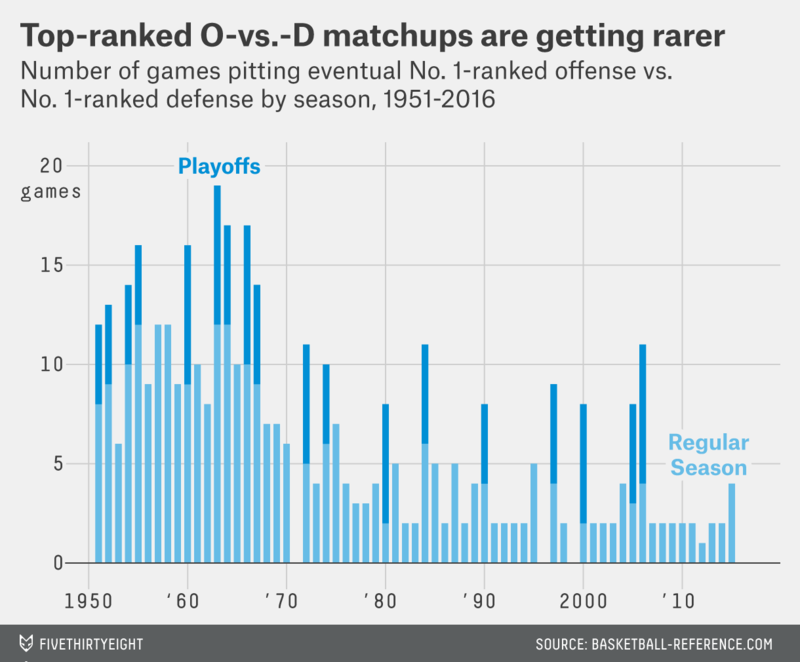 It’s a phenomenon that occurred upward of a dozen times per season in the NBA’s first few decades, but it’s getting rarer and rarer in recent years because of expansion, scheduling constraints and a larger playoff field. The best opportunity we had to witness No. 1s face off in recent years came in 2005-06, when the Dallas Mavericks offense faced the Spurs defense 11 times. Offense prevailed in that case — Dallas won 55 percent of the time, scoring 11.4 more points per game than San Antonio usually gave up that season — but that’s an exception to the general trend since 1951. In 414 meetings over the past 65 NBA seasons,2 the top-ranked defense has beat the top-ranked offense 55.3 percent of the time. In those games, 3 the No. 1 defense gave up 4.1 more points than their average, but the No. 1 offense scored 5.3 fewer points than their average. Some of that is because the defensive teams have more often been better overall clubs — hello, Bill Russell-era Celtics! — but we can account for this using FiveThirtyEight’s Elo ratings, which set pregame odds based on the relative qualities of the teams. Elo would have expected the No. 1 defenses to beat the No. 1 offenses 54.9 percent of the time, so the defensive teams are winning slightly more than expected when they face their offensive doppelgängers. That’s the aggregate of matchups between No. 1s since 1951, though. What about since the mid-2000s, when the league finished a nearly decade-long project to overhaul its defensive rules and cut down on hand-checking? The trend is inconclusive: In the relatively small sample of 38 matchups since 2004-05, top offenses are winning less than Elo would predict — yet, they’re also taking more of a bite out of top-ranked defenses than those defenses are doing to them at the opposite end. Those recent rule changes certainly are having the intended effect at a leaguewide level (pace and offensive efficiency are up since the early 2000s); stay tuned to see if it translates to these kinds of strength-on-strength matchups as well. Those are all broader trends, though. 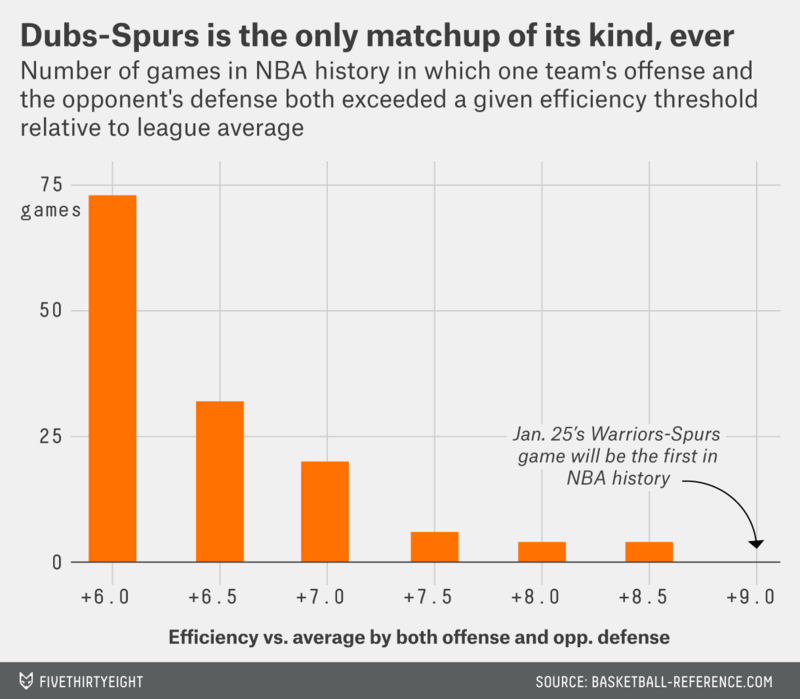 What makes Monday’s Spurs-Warriors game historically unique is the sheer quality of each team’s dominant unit. Only four games in NBA history have ever seen an offense 8 points better than the league’s efficiency face a defense 8 points better than that same league standard, and all of those were between the Spurs and Mavericks during the 2003-04 season.4 This game will do those one better by pitting a plus-9 offense against a plus-9 defense, an NBA first. Under such extreme circumstances, it’s tough to say which side of the ball has the advantage — we simply don’t have enough of a sample of comparable matchups. And our other bits of evidence from history are mixed; defenses hold a slight all-time edge, but that may have eroded with recent seasons. (Or not.) Monday’s matchup won’t serve as a referendum in either direction, but it should be a spectacular clash of styles featuring basketball at perhaps the highest level it’s ever been played. After removing duplicate games from the same playoff series. Today’s Warriors-Spurs matchup will be the first No. 1-versus-No. 1 clash of the 2015-16 season, though it isn’t set in stone that these squads will finish the year No. 1 in their respective categories. Excluding the game in question if it’s a regular-season contest. Somewhat under the radar, those Mavs had the best offense — relative to the league average — of all time, although this year’s Warriors might top them.